Live in the neighborhood? Stroll over for a casual bite. Don’t? 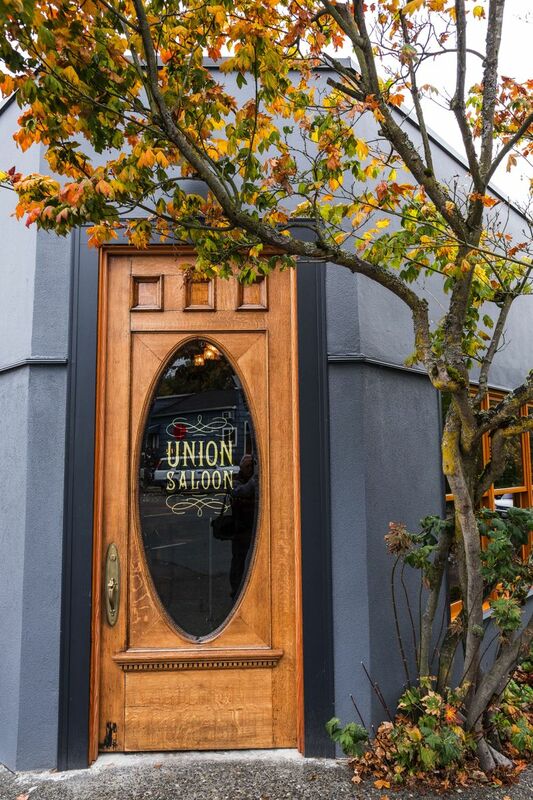 Still drop in to Wallingford’s Union Saloon for comfort food with surprise twists. Union Saloon is my new happy place. 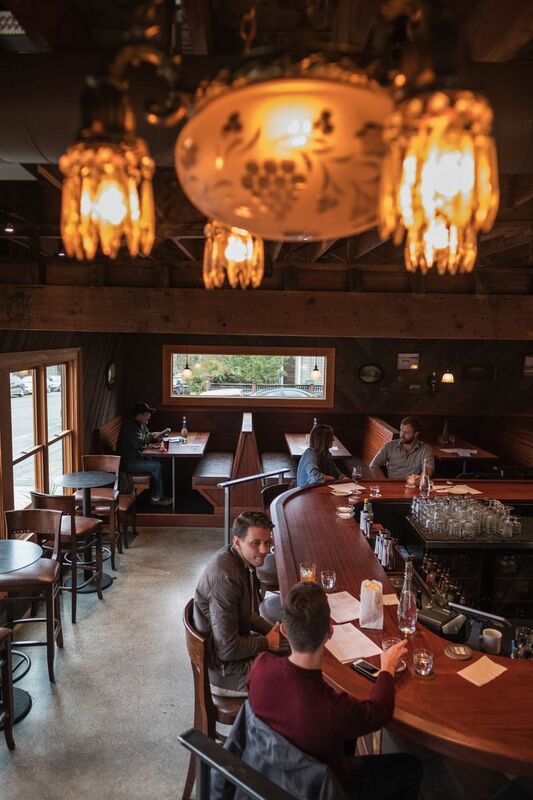 The cozy Wallingford spot has a horseshoe-shaped bar where you can have a full meal or just nurse a $3 Coors draft while munching kettle corn. There are two-tops for date night and booths roomy enough for six. Though custom-clad in dark sapele wood that mimics the richness of mahogany, the place isn’t fancy, but it’s no dive bar either. Saloonkeeper Michelle Magidow and her team dish up good food at modest prices, giving anyone in the neighborhood reason enough to scrap plans to order in or warm up leftovers, change into something other than sweats (or not), and leave the house. Eight bucks buys a well-made cocktail. Perhaps a Negroni served in a delicate coupe, or one of the dueling Old Fashioneds — with muddled orange or without. Each has its virtues. The dinner menu is long on snacks and sandwiches but also encompasses a couple of salads, a pasta, a seasonal soup and more substantial plates. No item shatters the $20 ceiling. It’s comforting fare that often has a surprise twist. Seaweed powder and cayenne dust the house-made potato chips. Bonito flakes lend smoky intrigue to an otherwise classic, and bountiful, Caesar salad. A dash of togarashi perks up excellent fried chicken fashioned from sake-brined, boneless thighs. Lovely little pickled things accompanied that chicken — green tomato wedges, mustard seeds and petals of pearl onion. Pickled celery punctuated a plate of crumbled sausage and crispy Butter Ball potatoes. The sausage is Uli’s spicy Italian; the potatoes are roasted, smashed and then deep-fried. The result is a delicious, hot mess of contrasting textures, served under a mound of mizuna greens dressed in a piercing mustard vinaigrette. Those amazing potatoes play a major supporting role during weekend brunch. They contribute crucial crispness to hash made with corned beef tongue, an immensely satisfying jumble of meat and vegetables topped with two perfect poached eggs. Butter and a pot of sweet raspberry jam accompany the Saloon biscuit. It’s as big as a hamburger bun and crumbles gently like a scone. The French toast was halfway to wonderful, but the thick slices of house-made brioche were not quite uniformly golden and a little too wet in the middle. A side of potatoes comes with the open-faced breakfast sandwiches. One has an invigorating schmear of pepper-spiked goat cheese under braised greens and scrambled eggs, an inspired combination, but I wish the underlying slab of house-made focaccia had been toasted. Magidow is partial to open-faced sandwiches. There are several on the dinner menu, too, and you have the option of substituting polenta for focaccia. Polenta worked especially well as a platform for the saucy, piquant braised pork cheeks. Poached eggs cap the brunch version; at dinner they come with shaved fennel on top and a rousing side slaw of mustard greens and Napa cabbage. Those pork cheeks taste straight out of Salumi’s playbook. Magidow cooked there in the early years of that Pioneer Square institution but her Seattle restaurant career goes back even further. She recalls being “the first girl to cook on the line” at the formal French restaurant Le Tastevin, which closed in 1993. Her résumé includes The Ruins, Café Lago, Lark, Harvest Vine and Delancey. 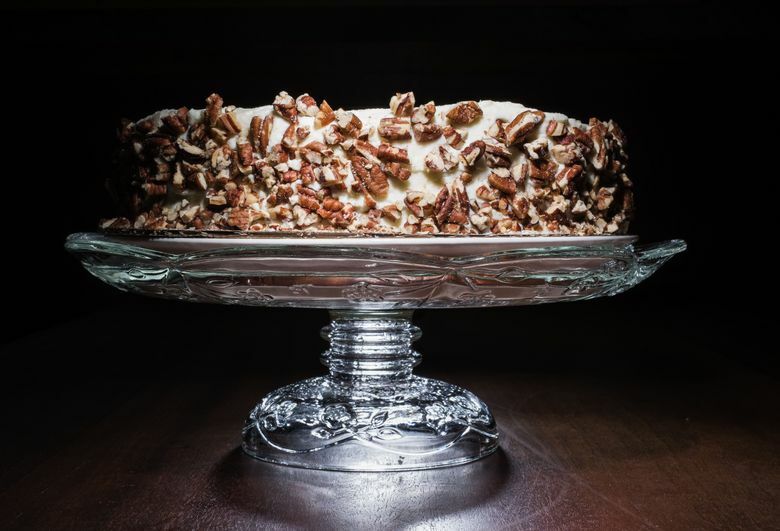 She was a partner in the bar Licorous and made desserts for Matt Janke’s original Matt’s in the Market. 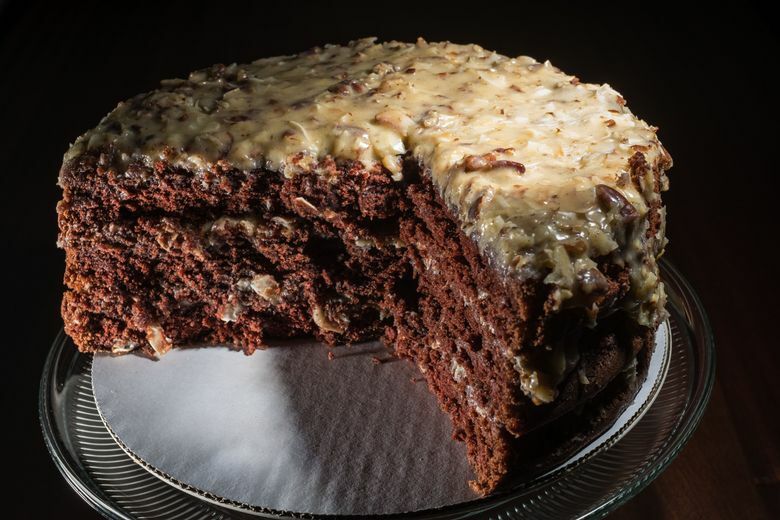 Cake stands on the kitchen pass-through here display her creations: a German chocolate layer cake iced with crème anglaise, and a pineapple and pecan-studded carrot cake with half an inch of cream-cheese frosting. You won’t go wrong with either choice. She entrusts the rest of the cooking to Blake King and Pedro Perez, chef and sous chef, respectively. 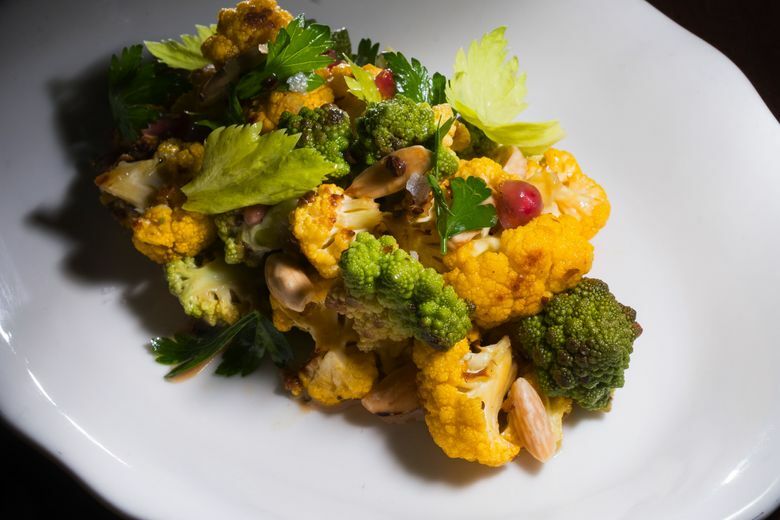 King worked in a Michelin-starred Chicago kitchen and recently spent three months in Japan, which explains the togarashi, the bonito flakes and the touch of soy in the almond sauce underneath a vibrant roasted yellow cauliflower salad speckled with pickled pomegranate seeds. Perez worked at Delancey and honed his pasta-making skills at Volterra. 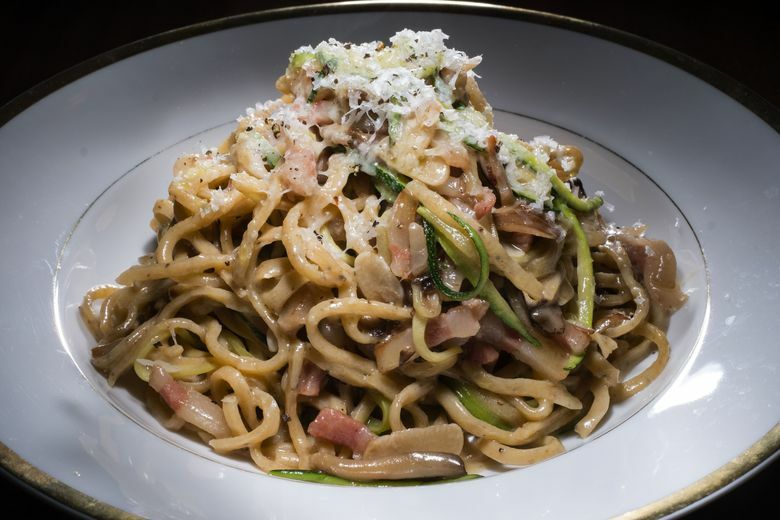 One bite of his guanciale-laced, peppery-flecked chitarra noodles transported me to Tuscany. The Oaxaca native also gets kudos for sautéed prawns in a vivid chipotle pepper and tomato sauce. Bedded on creamy polenta, it’s a dish for shrimp-and-grits fans. My favorite place to sit at Union Saloon is along the northeast curve of the bar. From there you can see downtown Seattle framed by a picture window. It was cut into the side of the single-story building for additional light; the view was a calculated dividend. Every detail of the design and décor was thought through. Not wanting to put a new door on a building that dates to the 1940s, Magidow searched online and found a vintage oak door with an oval glass insert in Maine. 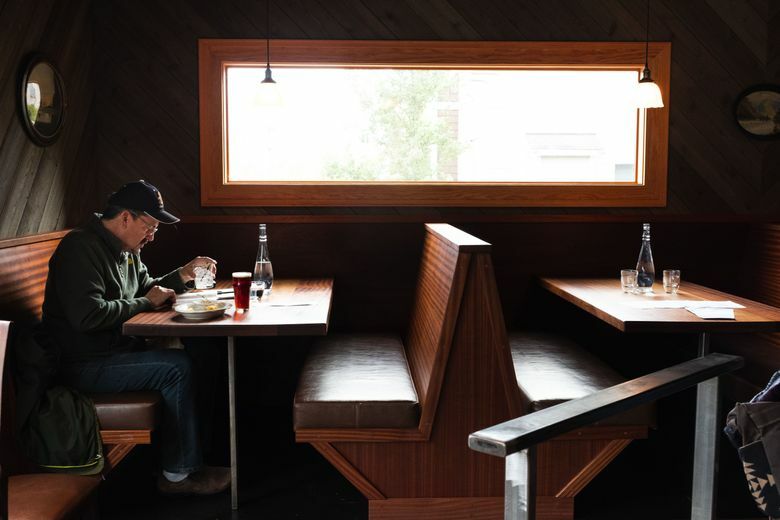 It sets just the right tone for the lavishly wooded interior designed by Mike Mora of Heliotrope, the Ballard firm whose other restaurant projects include Joule and The Whale Wins. The stunning joinery is by shipwright Adam Karpenske. Magidow made the diamond-shaped chocolate leather panels that cover the base of the bar. 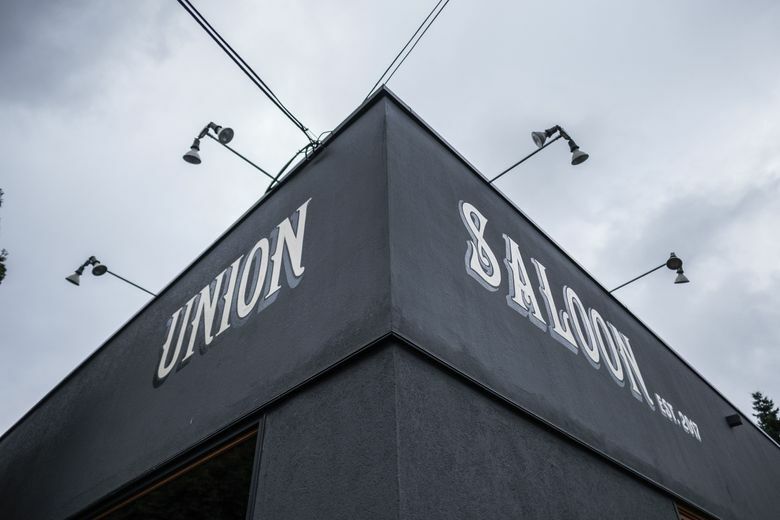 In a phone interview, the chef-turned-proprietor told me her heart has always been in the kitchen, but she’s figured out how to have the best of both worlds at Union Saloon. Sounds like it’s her new happy place, too.